Sony has apparently filed patent papers detailing its designs for controllers which can tell how stressed you're feeling and adjust your experience accordingly. Though very little has been said about the future of biometric gaming ever since Nintendo's Wii Vitality proved unfit for its purpose, potential applications for these devices have not escaped other hardware companies. 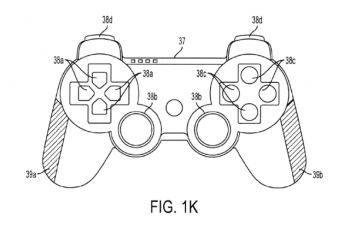 According to patent papers filed several months ago, Sony could be planning to create a biometric controller which would adapt your gameplay experience based on physical readings taken from your hands. The patent papers, found by Siliconera, apparently show diagrams of DualShock 3 and Move controllers fitted with integrated biometrics readers which monitor sweat levels, heartrate and muscle tension. Interestingly, there's also a diagram of a handheld device (which bears more than a passing resemblance to the Vita) which is fitted with similar readers. The idea appears to be that these integrated readers gather second-by-second information on how stressed or excited you're feeling and adjust your gameplay experience to match your mood. - Weapons that change depending on how stressed you are. An increase in stress level could make a weapon more accurate or less steady, which will make it difficult to target an enemy. Sony specifically mentions a sniper situation where the weapon becomes more steady if you're relaxed. - Tensing up your muscles to withstand an attack or charge up a shield. - A video game character whose facial expressions, movements, posture, and even voice changes depending on your biometric data. For example, this character will sweat when a player is nervous. - An adrenaline style boost which will let you run faster, jump higher, and punch harder when stressed. - A health bar that depletes more rapidly if you have a high stress level. - An attack button that changes a character's move depending if the player is stressed or relaxed. - Background music and scenery that changes depending on your stress level. Matching music is one example, but Sony also proposes to change music to make a player more relaxed. Brightness of objects and the zoom level, representing a higher level of focus, are two ideas for scenery. - A game that adapts difficulty levels depending on a players stress level. If the above is serious and this turns out to be more than a case of forgotten patent papers gone huge, then it seems that Sony's controller - at least in these early stages - is in real danger of making games harder for you when you're at your worst. I'm not sure how many people are looking for their tense in-game moments to be rendered even more tense by a leaky health bar and a shaky rifle. Saying that, though, some of the other applications do sound useful, especially the idea of the soundtrack changing to reflect how tense you are (well, as long as it doesn't decide to start playing Moonlight Sonata at you in the middle of a boss battle or anything). Still, done right, the potential for this technology remains huge.